Michelle Ballantyne was accused of 'pompous Victorian moralising' after her comments. A Scottish Conservative MSP has defended welfare reforms, claiming those who do not work "cannot have as many children as they like". 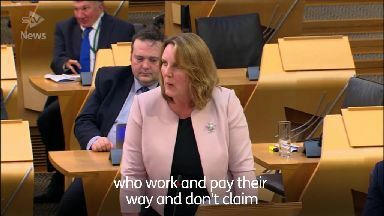 Michelle Ballantyne also told the Scottish Parliament's chamber that Universal Credit was a "key part of reducing inequality in this country". She said the six-in-one benefit payment was "working for the many", with any issues "almost wholly operational". Scotland's First Minister Nicola Sturgeon described its roll-out as an "unfolding disaster". Universal Credit was introduced as part of the UK Government's overhaul of the welfare system. However, cuts to payments and widespread problems with its implementation have led to many people falling into hardship or dropping out of the benefit system altogether. The introduction of the two-child benefit cap, limiting tax credits and Universal Credit to a family's first two children has also been attacked. Ms Ballantyne said: "The two-child limit is about fairness. It is fair that people on benefit cannot have as many children as they like while people who work and pay their way and don't claim benefits have to make decisions about the number of children they can have. "Universal Credit may have its flaws, but the thinking behind the system is sound. It is about making it better to be in work than not to be in work. "Regardless of what others may say, it's a fact that universal credit is working for the many, as are many UK Government employment policies. "Actually, I am proud to be associated with a welfare change which is genuinely designed to tackle poverty and inequality." SNP MSP Tom Arthur said it was one of the "most disgraceful speeches I have ever heard" in his time at Holyrood. "Six minutes of pompous Victorian moralising that would have been better suited to the pages of a Dickens novel," he said. "And to suggest that poverty should be a barrier to a family, that people who are poor are not entitled to any more than two children - what an absolutely disgraceful position. "And she should be utterly, utterly ashamed of herself." Other parties also criticised Ms Ballantyne's comments. Alison Johnstone of the Greens said "the two-child limit is not fair, and it's certainly not fair to the third child in a family". And Scottish Labour MSP Elaine Smith said: "There is no clearer illustration of (the UK Government's) contempt for those in need of a hand than the way in which Universal Credit has been rolled out across the country. "Case after case demonstrates the devastating impact of the punitive way in which Universal Credit has been introduced."